This view is from 75 km above Phobos, the larger of the two moons of Mars. Phobos' irregular shape is evident. 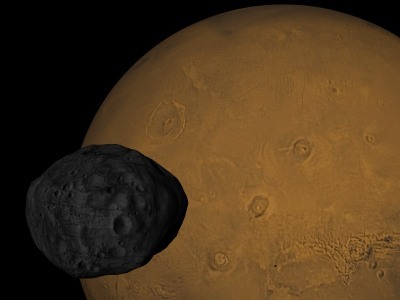 On Mars several shield volcanoes are visible, including Olympus Mons just above Phobos. The western end of Valles Marineris is visible in the lower right (the shadow of Phobos is also barely visible, although in reality it wouldn't show up that well). The field of view is 40°. The map of Mars was produced by the USGS and is available at David Seal's (JPL) Solar System Simulator website. 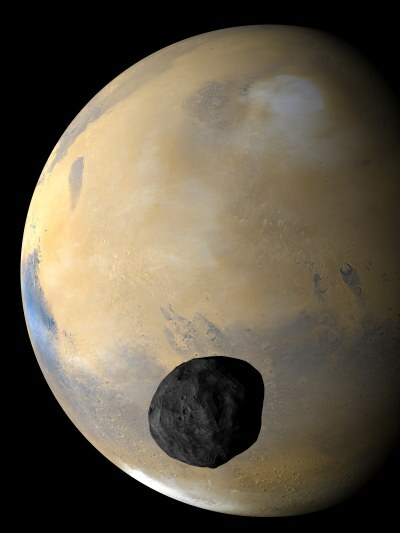 The rendering of Phobos started with the shape model by Philip J. Stooke. I reformatted this model for POV-Ray, then used the USGS map (also from Philip J. Stooke) to color it. 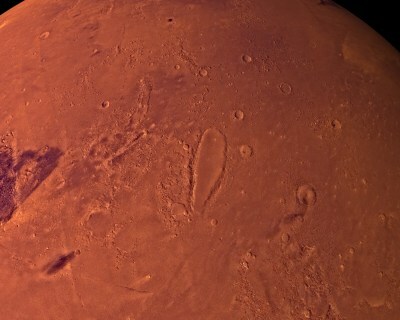 Here is Kasei Vallis on Mars, seen from a position 1,200 km above the Martian surface. Sharonov crater is in the bottom center. The Viking I landing site on Chryse Planitia is just to the east (left) of the area shown. Field of view is 30°. This uses a partial map of Mars from the USGS Flagstaff web site. From 1,700 km above Mars, this shows the unusual terrain of Deuteronilus Mensae and vicinity. 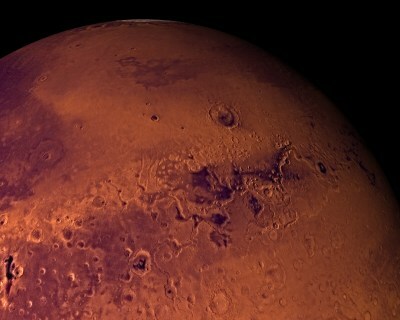 The large crater above the center is Lyot. The north polar cap is just visible at the top. This uses a map of Mars from the USGS Flagstaff web site. This view from 1,300 km above Mars shows the the 350-km long grazing impact crater Orcus Patera in the center. This also uses the map of Mars from the USGS Flagstaff web site. This is a view from the surface of Mars. This scene was generated with Terragen, a (free) scenery generating program. 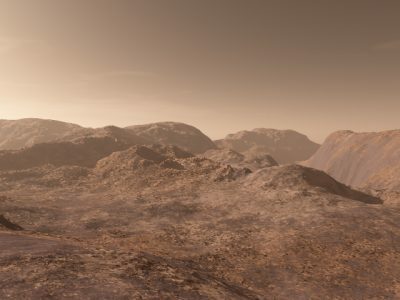 The included settings for scenes on Mars were used. This view, from 4,000 km above Mars, shows the planet's north polar cap. Field of view is 40°. 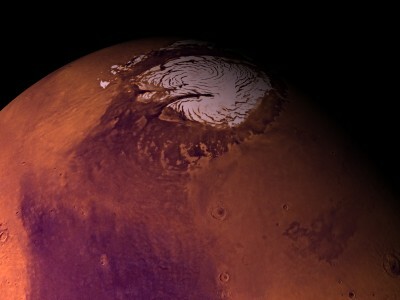 This view, from 5,200 km above Mars, shows Olympus Mons (top left) and the other large volcanoes of the Tharsis rise, along with a portion of Valles Marineris at center right. 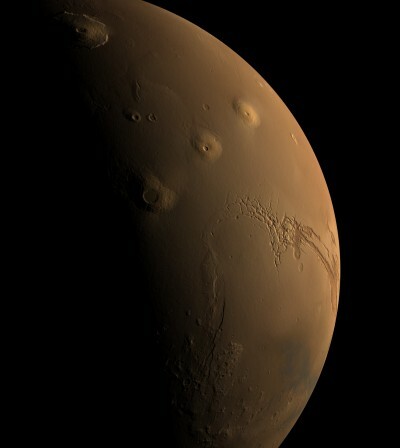 This uses the flat texture and bump maps from Red Mars version 2 at Space-Graphics.com. This view shows Argyre Planitia (lower left) and valleys to the east of Valles Marineris (upper left and center). 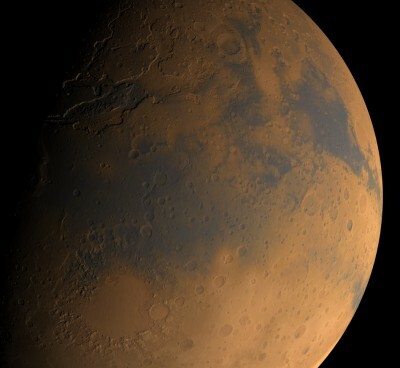 This also uses the flat texture and bump maps from Red Mars version 2 at Space-Graphics.com. This view from 122 km above Phobos shows Mars in the background, with frost in Hellas Planitia (bottom) and clouds over Elysium Planitia (top). 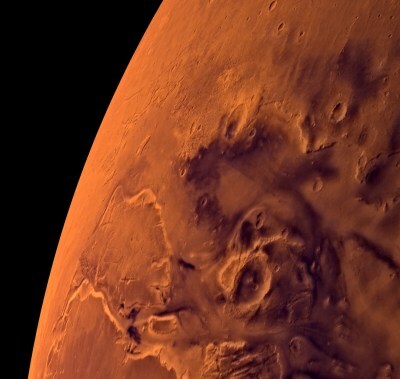 The Mars map is from the Mars Global Surveyor, assembled from images made in April 1999. The Phobos map and model are the same ones used above. Last modified 12 September 2004.